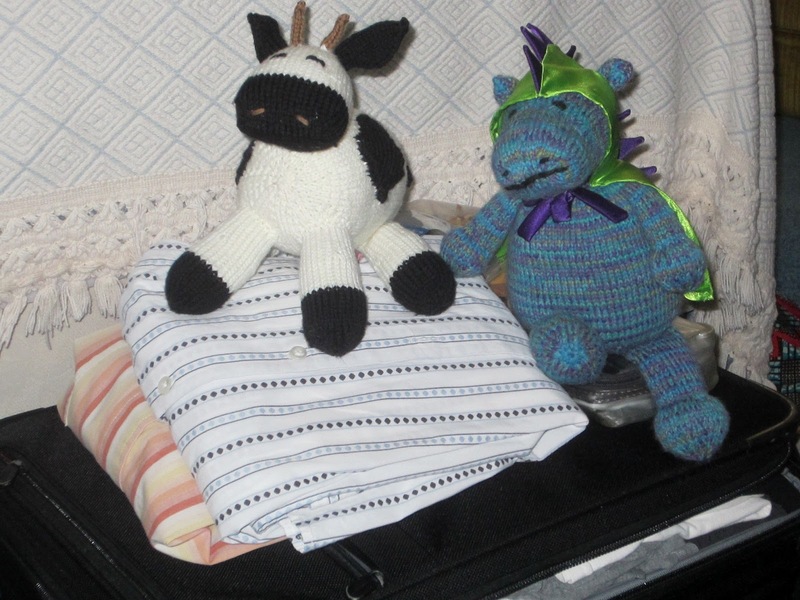 Clio & Phineas: Even Dragons Need Friends: Introducing Milkshake! Even Dragons Need Friends: Introducing Milkshake! Meet Milkshake! 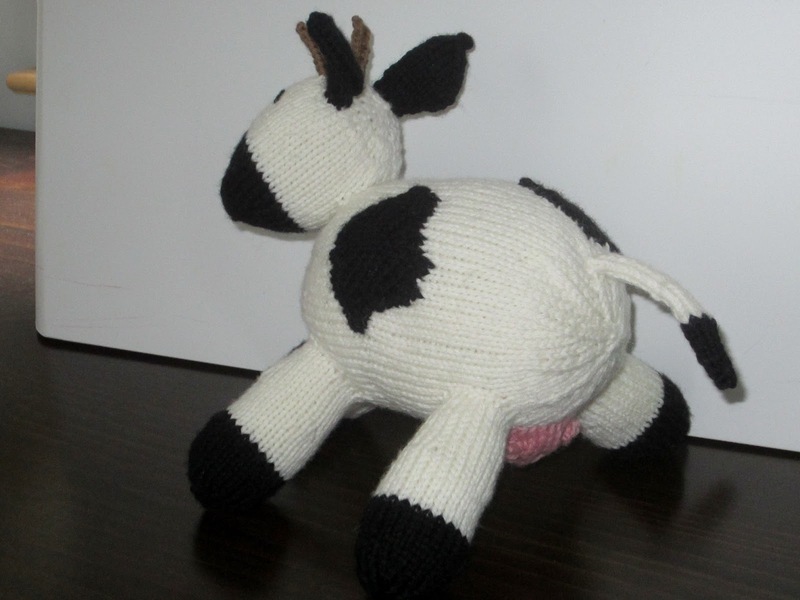 She was knit from Susan B Anderson's milk cow pattern with Knitpicks Swish yarn. Isn't she adorable? There is much hippo happiness in the Craft Lounge. I have to admit that I am not in love with this yarn. It is soft and nice to work with. BUT at just 110 yards per ball, it's skimpy compared to the Cascade 220 (which is the yardage, btw) that I've been working with. I literally used every inch of the white and have none left over. 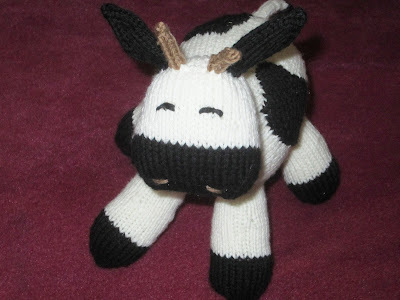 But the cow pattern was plenty cute! She even has udders. Actually, I picked up a new technique or two with this pattern, like picking up a few stitches from the body in order to knit the tail right on to it, rather than knitting the tail and then sewing/grafting it on. Other than that, there is not much to tell with this project. I finished knitting Milkshake right before we left, and Dragon and Milkshake wanted to stow away in the luggage on our vacation. They promised not to get into too much trouble while we were gone. Luckily the Tramples kept them in line. We arrived home last night from Istanbul. What a wonderful trip! Stay tuned for updates on my vacation, fabric and textile shopping in Istanbul, a very exciting give away, and more in the next several days. These are all so adorable! 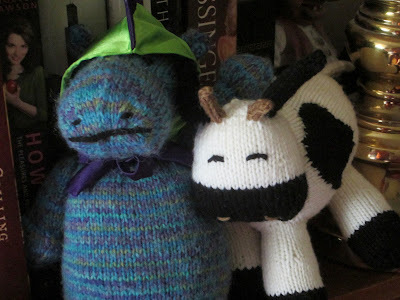 You are going to have a full Yarn Farm before too long. Seriously! It's become an obsession! Milkshake is adorable! You're tempting me to make one of these for my cousin's baby due in the fall... And I can't wait to hear about your fabric shopping in Istanbul, how awesome is that?! 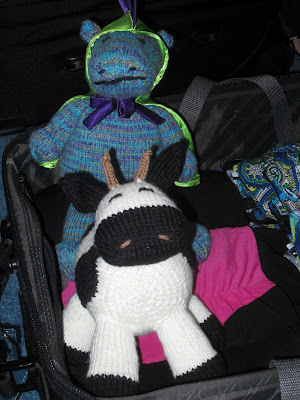 The cow was very easy! Go for it! Linen Trouser Jeans! And Vacation! 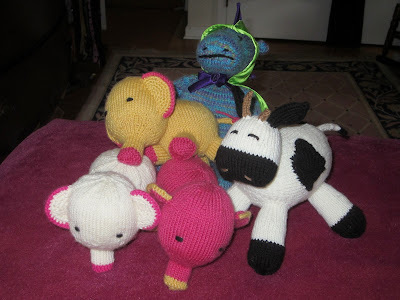 Gifts for Baby: Knitting Reveal! Finished: Clutch Purse x 2!